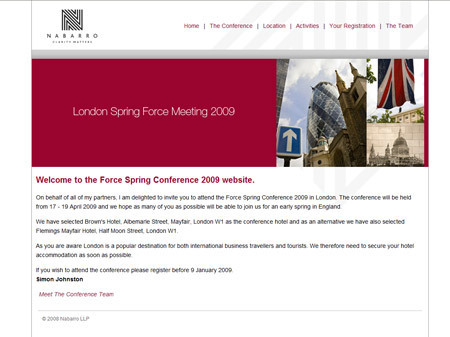 We have recently finished a registration site for the Spring Force 2009 Meeting in London this April. Working alongside Nabarro LLP, a secure site was constructed which allowed the invitees to log in with their details including specifying how many days they would be in the capital for and where they wished to stay. Other functionality included a booking system specifically oriented around the activities that were on offer during the weekend – such as visiting the Royal Opera House or attending a Premier League football match! Nabarro is a major corporate law firm renowned for their positive, practical approach. They operate in a number of industry sectors and legal disciplines. They are a growing partnership. They have 130+ partners leading 420+ lawyers offering a broad range of corporate legal services to major national and international clients. The firm’s headquarters are in central London. They also have offices in Sheffield and Brussels. They draw on longstanding relationships with an international network of selected firms for their cross-border work. In Europe, they have an alliance with GSK Stockmann & Kollegen in Germany, August & Debouzy in France, Rodés & Sala abogados in Spain and Nunziante Magrone in Italy.